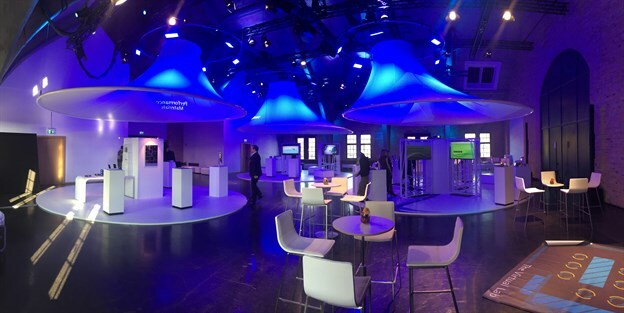 We were approached by a new client with a simple brief for two different areas within a pharmaceutical conference taking place at the impressive WECC in Berlin. The three cones for the exhibition stand area had already been design resolved, so we were able to move forwards quickly and create the 7m x 2.73m x 1.5m cones using a white polyester fabric. 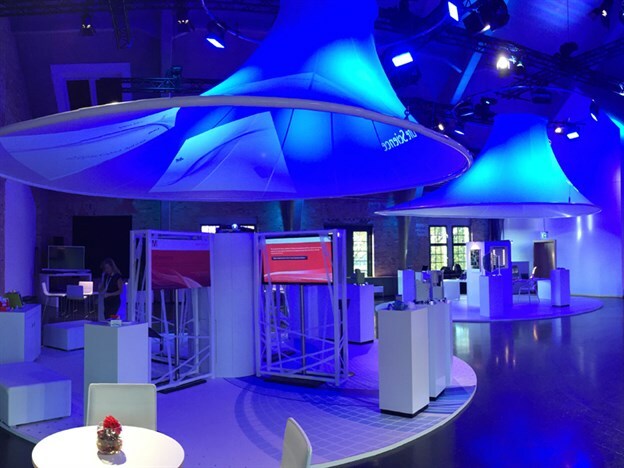 We assisted with design input on the three amoeba-like structures which were used as a feature in the central bar area of the exhibition space. We wanted to reflect the pharmaceutical theme of the show by creating these as cell-like molecular forms. Due to the short lead times involved, all of the items were fabricated concurrently - we 3D modelled everything so that we knew that it was all going to fit perfectly on-site, the fabric was laser cut, and all the components were bought together for final shipping. Ilumination really brings the canopies to life. The cone structures were lit from above, flooded with blue light and some gobo projection. The amoeba forms were lit from above to produce a glowing effect. The installation took place over two days and our client was exceptionally happy with the final result! They plan to reuse the structures, possibly as a feature at their headquarters.